Localizado nos arredores de Negril, o Little Bay Country Club é um condomínio fechado com residências e moradias de luxo. A propriedade apresenta dramáticas falésias escarpadas com vista para as vistas deslumbrantes sobre o belo Mar do Caribe, bem como a sua própria praia privada de areia branca. Da praia, entre na água turquesa de Little Bay, um santuário de peixes protegido que é ideal para snorkeling. Dentro de nossa casa, cada detalhe foi pensado e é verdadeiramente uma casa longe de casa. Recentemente, fizemos muitas atualizações em nossa propriedade para melhorar a experiência de suas férias conosco. De chuveiros walk-in de azulejos para um gazebo à beira-mar com vista para a baía, pensamos em tudo para que você possa relaxar e aproveitar o seu tempo em Negril. Little Bay Country Club inclui segurança fechada 24 horas, bem como guardas de segurança com caninos que visam a propriedade o tempo todo. Com todo o charme e beleza da Jamaica e as comodidades que você está acostumado, nosso condomínio à beira-mar de dois quartos é o lugar perfeito para umas férias relaxantes jamaicanas. Nosso condomínio é espaçoso e dormirá confortavelmente com quatro pessoas. Oferecemos um aluguel privado de casas de férias à beira-mar em Negril, Jamaica. É uma propriedade recém construída, de alta qualidade, com vista para um santuário de peixes protegido e um recife de coral. Ao se hospedar em nossa casa de férias, você estará a uma hora e meia do aeroporto internacional de Montego Bay e a 5 minutos de uma pista de pouso local. Você vai desfrutar de um refúgio relaxante com um ambiente lindo quando ficar em nossa casa em Little Bay. A casa de banho principal foi recentemente renovado e apresenta agora um grande pé-no chuveiro azulejos e vaidade de grande porte com pias duplas. O banheiro principal tem uma bela vista da praia e do oceano, que pode ser visto a partir do chuveiro envidraçado. O segundo banheiro fora do quarto de hóspedes também foi recentemente renovado com uma grande caminhada de azulejos no chuveiro. Esta propriedade é perfeita para aqueles que procuram se afastar da azáfama da vida cotidiana. Em nossa casa particular, você poderá relaxar com as belas vistas e sons serenos do oceano. Perfect holiday home in paradise! This was our 2nd time renting in Little Bay Country Club & what a difference location makes. The wonderful yellow house is in a sweet spot on the beach & we loved our 2 week stay. This comfortable home is very pretty with a lovely beach decor. Anna the caretaker keeps the place spotless & is always available if necessary to ensure you feel at home. You have all the amenities for a self-catering beach vacation in a safe & friendly community. Amanda manages the family property & it was a pleasure to rent from her. Everything was perfect & we had a very relaxing vacation on a splendid secluded beach with great swimming & snorkelling. Highly recommended! We had a wonderful stay at Amanda’s townhouse. From the friendly/helpful guard at the security gate, to our final good bye to Anna the caretaker. The VRBO pictures are exactly what you experience. The townhouse is very clean & roomy with many homey features. Nights are very quite (unless you open the windows to hear the ocean waves) & perfect for sleeping. The fish sanctuary is great for snorkeling right from the beach. Anna is a treat. She will help you with whatever you need, has a great personality, is fun to talk to & makes a great Jamaican supper. Make sure you find the mangrove & beach walk along Bloody Bay past Rui. Also there is a spot next to the townhouse on the cliffs perfect for private sunsets. Thank you so much for your review. We are so glad you enjoyed your stay at our home in Little Bay! We do our best to make sure that our property is a home away from home for all our guests. Thank you again and we would love to have you back anytime! beautiful, quiet, on the beach! This was our second time staying at this property, and it was just as great as the first time. We have 2 small kids, and the proximity of the large pool and the small beach (15 steps) is perfect for us. Also, the house and kitchen are well stocked with staples, towels, pool floats, snorkeling gear, so we can pack light. 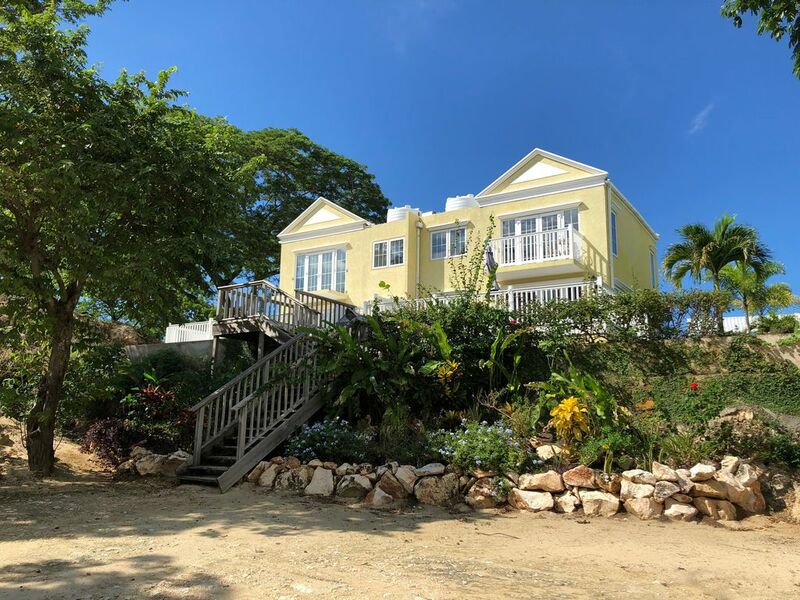 The property is very clean and comfortable, set in lovely gated community 10 minutes from the main Negril beach. There is a Jamaican couple who look after the place, and they were also able to help with advice, shopping, and transportation - much appreciated! Thank you so much for taking the time to review your stay! We are so glad that you returned for another visit to our home at Little Bay. We appreciate the kind words and do our best to provide all the amenities we can for our guests. We hope you and your lovely family return soon! What can we say?? This is an absolutely perfect place for us. The community where the home is located is beautiful, friendly and safe. The home exceeds expectations in style, luxury and convenience. We could let the ocean breeze in through the french doors in the early morning....step out on to a huge deck or balcony and see the ocean rolling into the shore. The private beachfront offers coral reef for snorkeling and a swimming area. The infinity pool overlooks the beach and chairs and umbrellas are ready to use. We also enjoyed the basketball courts and tennis court. After time on the beach, it was so simple to step back up to the deck...hose the sand off our feet and grill our lunch or call for transportation into town to enjoy the charm and character of Negril. The home is stunning, clean and truly has every comfort you can think of. Luxury towels, beautiful glass showers. A fully stocked kitchen. Comfortable, cozy and elegant furnishings make you feel right at home in paradise. So very relaxing!! The managers of this property are easy to access, communicate with and care about your comfort and enjoyment for your stay. They make transportation easy and you can even enjoy meals prepared in the home if you'd like! The space to spread out and relax plus luxury not found at a resort make this a win-win for complete relaxation and a laid-back Jamaican experience. Enjoy! Thank you so very much for taking the time to write a review of your stay. We really appreciate the feedback and are so glad you enjoyed your time at our home in Little Bay! We are always striving to create the perfect place for our guests to spend their vacation and we are thrilled you noticed some of the thought and details that were taken into consideration when we were designing, purchasing and decorating. Our goal is a place where our guests feel at home but we didn't want to lose touch of the tropical vibe and beach setting. Anna and Linley do such a great job of taking care of things for us when we are not there. We feel confident sending guests to our home, knowing they are there. Thank you again so much for your stay and for your thoughtful review. We welcome you back anytime! Property was nice, there was a misunderstanding with the host. Also during our stay the power was knocked out due to a bad accident that left us with no power for over 8 hours suffering in the heat and wasting the groceries we just bought. Other than that we enjoyed our stay on the property. Thank you so much for the review. Our apologies for the inconvenience about the power. Unfortunately, there was nothing we or anyone else could do to prevent or avoid this. The power supply to Little Bay Country Club and to our home generally has no issues. The car accident on the road outside of the property that knocked out the power was an isolated incident and tragically, life was lost. Again, we apologize for any trouble this may have caused you and your group. We had such a relaxing and enjoyable time at this property. The home itself was sparkling clean...steps to the ocean and the pool. Anna was SUPERB...anything we needed she was right on it...and her cooking? AMAZING authentic Jamaican cuisine. I can't wait to go back. We really appreciate you taking the time for a review of our home at Little Bay and are thrilled you enjoyed your stay! Anna does a fantastic job of taking care of our property and our guests. We rest assured knowing she is there taking such expert care of things! We hope you will come back and stay again soon. Thanks again! Nossa propriedade está localizada nos arredores da cidade resort de Negril, Jamaica. O apelido de Negril é "A Capital do Casual" e certamente faz jus a isso. Maiôs e chinelos são o traje principal, já que a maioria passa seus dias na praia à beira-mar. Negril tem tantos bons bares e restaurantes que não só servem boa comida e bebidas, mas também mergulham na cultura da Jamaica e conhecer algumas das pessoas maravilhosas que vivem lá e chamar Negril casa. O mundialmente famoso 7 Mile Beach é cheio de giz para comer e beber, bem como loja e, claro, chance de cercar-se da cultura vibrante e surpreendente da Jamaica. Downtown Negril tem algumas das comodidades modernas que você pode precisar em sua viagem, incluindo mercearias, farmácias lojas de presentes e caixas eletrônicos. Viaje um pouco mais e você acabará no extremo oeste de Negril, mais conhecido como "The Cliffs". De The Cliffs você experimentará uma parte diferente de Negril e as vistas do pôr do sol não podem ser batidas. Negril tem muito a oferecer, está apenas esperando por você para vir explorar! Há muitos locais deliciosos para tomar café da manhã em Negril, onde você pode desfrutar de pratos jamaicanos ou internacionais. Muitos dos hotéis à beira-mar, como Travelers, Charella e Coco La Palm recebem turistas para um café da manhã a preços razoáveis. A 7 Mile Beach de Negril é frequentemente incluída nas listas das 10 praias mais bonitas do mundo. Reserve um tempo para caminhar, nadar e tomar banho de sol ao longo de 7 Mile e apreciar as vistas, os sons e a cultura da famosa praia de Negril. Para os mais aventureiros, você pode desfrutar dos muitos esportes aquáticos e atividades oferecidas ao longo da praia. As opções incluem snorkeling, vela, parasailing, jetskis, pesca, passeios de barco e cruzeiros de catamarã e muito mais. Há muitos lugares para parar para uma bebida ou uma refeição ao longo 7 Mile Beach, bem como muitas opções de entretenimento. Confira os locais de música ao vivo, como o Drifter's ou o The Boat Bar, onde você pode desfrutar de música ao vivo a tarde toda e à noite. Se você planeja um jantar fora, há uma grande variedade de excelentes bares e restaurantes, servindo todas as maneiras de delícias culinárias. Para uma experiência verdadeiramente jamaicana, experimente as especialidades locais ou um peixe fresco do dia. Ao longo da estrada da praia, recomendamos Best in the West, Kuyaba, Sweet Spice e Vinnies. Se você se aventurar até o extremo oeste para jantar, confira alguns de nossos lugares favoritos, como Ivan, The Blue Mahoe, Pushcart e Murphys. Se você estiver procurando por alguma vida noturna, confira alguns dos locais noturnos locais como Bourbon Beach, Alfred's ou Roots Bamboo para bebidas. música e dança.